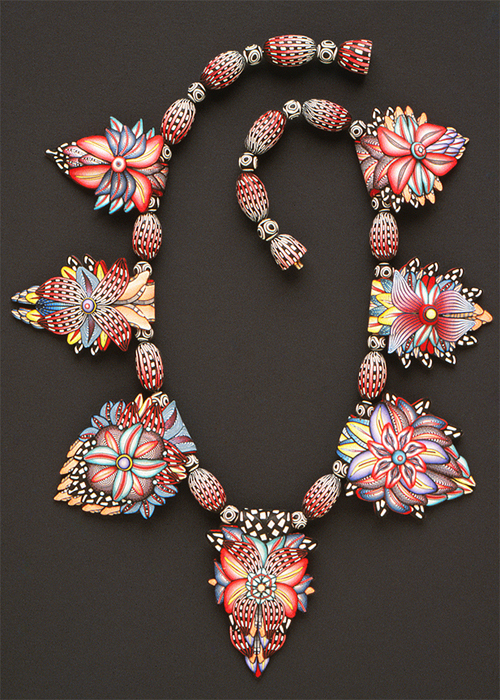 Early polymer pioneers, Michael and Ruth Anne Grove, left the business several years ago and are selling the last of their work this July 3 in California. The couple perfected the pre-Skinnner “step blend” and created magnificent complex canes and jewelry. Not familiar with the works of these polymer pioneers? You can read up here and here and find them in many books. me want to see more. Thanks for the update on the Groves. They might like to know that people still come into my booth at shows wearing their earrings and ask me if I know their work, where they are, what they’re doing. One of the benchmarks of art is how it touches people’s lives and the emotional content that attaches us to it. The vibrant, magical, fanciful work of Michael and Ruth Anne certainly achieved all of that. Thank you both…from those who came after. The very first pair of Polymer clay earrings I ever purchased were made by Grove and Grove. I still have them. I remember seeing their jewelry pieces in a Museum Store, and wondering with amazement how did they keep those lines so crisp, and how did they cut the pieces so thin and even. Later I was able to talk with Michael at a show, where I purchased the earrings, and he said he had a special tool to cut the canes (I think he said like a guillotine). They inspired me to as Michael says “PLAY” with clay. I’d love to go to San Francisco for their sale…what an amazing opportunity. I don’t know if I can schedule it. Oh, NOT FAIR to those of us far far away! I’m gonna pout for days over this! I’m not sure how anyone could “leave behind” working with polymer clay — it’s such an addicting, amazing medium. Always great to see these pioneers and their fabulous cane work. Thanks for featuring them. You must have some seriously great glasses to do such detailed work? WOW! I can’t imagaine how long that must have taken? I can’t wait!! Berkeley is right up the road from me, and my birthday is that weekend. I have been hearing rumors of this for awhile. Oh, I so wish I was closer to them. Texas is a bit of a journey but I am sure it is worth it. They are the first artists that really inspired me to do the clay and I have been looking for them for years. I love their art. I wish I could go with all of you who can go and buy their canes. What an honor to own some of their work. Enjoy the ride as they have over all these years. Wish I had a ticket to go. You guys in CA have a great time and buy, buy, buy. My best wishes to Michael and Ruth Anne what ever they plan for their future! I hope they are teaching and have not given up PC altogether. I, too, wish I could be there. I would so love a bundle of their canes. I saw their work in Santa Monica when I was just starting out with polymer clay. I fell in love with the necklace of ladies faces, turbans, and flowers (I’m 75 next month-so hope I’m remembering it right!). If they will sell anything thru mail, phone, or on line I’m up for it…or if someone going would purchase for me? I had the great good fortune to take advantage of this sale! I almost didn’t go because the traffic down I-80 is usually awful and I couldn’t go in the morning. But made it down with no problem in the early afternoon and they weren’t cleaned out! Picked up some of the loveliest canes and got to meet Michael and some of his friends — some very nice folks! I’m so inspired and really looking forward to playing with the canes — after I finish my crochet project that is currently cluttering up my clay table — LOL! Wow, that would have been wonderful to visit and buy those gorgeous canes. Lucky ladies who were able to attend. Can only dream about it here in Australia. What an amazing experience that would have been!! !